Pioneer Corps. During his inspection of the Guard the Field-Marshall spoke to several members of it and to the OC. He next inspected the Standards of the Corps Association which were on parade and then shook hands and chatted with many Pioneers including Mr A Brett, who lost both hands and the sight of both eyes in Italy, also to several of the OR's and Officers who were present. The narrow platform was crowded. Many who would have liked to shake the Field-Marshall by the handy were unavoidably prevented, as time was very limited. Mr Darbyshire invited the Field Marshall, Major General Field and Brigadier Edye to move to the raised platform and having done so, he opened the proceedings with a short but interesting speech in which he mentioned the request received from the Association some weeks ago - asking if it were possible for one of their Locomotives to be named. The Royal Pioneer Corps and how he and his colleagues promptly replied "Yes, they would be delighted to arrange the matter and to commemorate the splendid work and record of the Corps. Since that time matters had moved swiftly and smoothly until now when all present could see the Locomotive which in a few moments the Field-Marshall would formally name. The Locomotive (which bore plaques of the crest of 'The Royal Pioneer Corps' presented by the Royal Pioneer Corps Association) is one of 52 LMR 4-6-0 'Patriot' class passenger tender engines, many of which are named after regiments of the British Army and men who served with distinction in the 1914-1918 War. 'The Royal Pioneer Corps' Locomotive was built at Crewe Works in 1932 and was engaged on express duties from the Carlisle depot. In full working order she weights 123 tons 9 cwts, wheels are 6ft 9ins diameter, tender has a coal capacity of 5 and half tons and a water capacity of 3,500 gallons. Overall length of the engine and tender is nearly 62ft 9ins. The drivers at todays ceremony was Passed Fireman Edward Tassiker of Willesden Sheds who served in the Royal Pioneer Corps from October 1939 to April 1946. He made seven spectacular escapes from the enemy after he was first captured in May 1940. Assisting Passed Fireman Tassiker on the Locomotive was Fireman E Hodgson who saw military service in the Royal Engineers from September 1939 to March 1946. During the recent war the Corps were, among other places at Dunkirk, Salerno, Anzio, North Africa, Normandy, Burma, India, Iceland and Faroe Islands, for the Pioneers were not only engaged on labour tasks behind the lines but in all the big landing also. 26 Companies went ashore on D Day in Normandy. By D Day plus 6 there was 81 Companies and 11 Group HQ's in France. Army Commanders in every theatre of war paid full tribute to the work of the Corps without which they freely admitted that the war could not have been won. Over 2,800 British personnel of the Corps laid down their lives overseas. In conclusion Mr Darbyshire stated how happy he and his colleagues were to have been of service in helping to bring the record of the Corps once more before the public and he was sure the Royal Pioneer Corps Locomotive in the years to come would continue this good work. 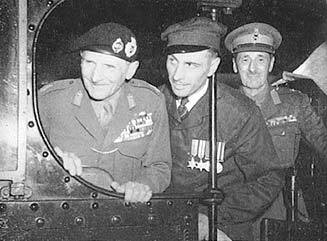 He thanked Field-Marshal Montgomery for giving so much of his time in these busy and trying days to come and name the engine and then called on Major General Friend to speak. 'I am very glad to take part in this ceremony here today of naming this engine. Early on in World War II it became apparent that the needs of modern was made it essential to have an organised body of men fitted and trained to undertake the many tasks of construction that were required. Such tasks included the construction of airfields, roads and base facilities, and so on. None of it work which carried with it much glamour or limelight, but never the less it was work vital to the final victory'. This need was met by the formation of the Army Pioneer Corps. Into its ranks were drafted regular reservists and territorials, who by reason of their age and physical debility could not take their place in the firing line. Business men and other civilians who, because of their peace time experiences were suited for labour work, were found to give the Corps its necessary technical guidance. These men formed themselves into a very fine body of soldiers with a fine esprit de corps : soldiers in every sense of the word, as in modern war one never knows when the men in the back areas will find themselves involved in the fighting, as happened at Dunkirk. During the campaign in NW Europe the Pioneer Corps was faced with a tremendous task. All the base facilities had to be built completely from scratch - air strips had to be put down and developed into full sized air fields. All manner of work was given to this Corps and history has shown how well it performed its task. In recognition of this, in 1946, His Majesty The King bestowed upon the Corps and history has shown how well it performed its task. In recognition of this, in 1946. His Majesty The King bestowed upon the Corps the Appellation of 'Royal' - from then on it became 'The Royal Pioneer Corps'. It is a very appropriate thing that the British Railways should have seen fit to name this engine after a Corps with which the Railways were so closely related during the war. It does not need me to remind you what great work the Railways performed. The movement of men and material went on steadily even in the darkest days when they were a constant target for enemy bombing. The Railways had a vital part to play in the war effort and they never failed. Some people think that now the war is over the work of the Royal Pioneer Corps is done. This is very far from the truth. This Corps, with no long tradition to fall back upon, and without much to bring it into the public eye, must continue with its work. It must never forget the great reputation that it built itself in the last war. There is still much for it to do and if, by nature of its requirements, it does not receive the men of the highest medical category, it must not be daunted. Its role is as important and as vital to the Army as ever it was. I will now perform the naming ceremony, but before I do so, I will join with all of you in wishing this engine many years of good service in the hands of the British Railways. After the naming, the Field Marshal, General Friend, Mr Darbyshire and many others inspected the engine. The main ceremony being over, the Guard came smartly to attention and gave the general salute on the departure of Field Marshal Viscount Montgomery to whom all Pioneers will always be grateful for the great tribute he paid and the service he rendered to our corps and Old Comrades Association by coming to this ceremony. The Railway Executive kindly invited a large number of Pioneers to tea and refreshments at the Euston Station Hotel and the Association did the same for nearly 40 others who were accommodated in the Dining Room at Euston Station. It is certain that all who were present will remember this happy event for a long time to come. Thank you Mr Darbyshire and all your colleagues and Staff and not forgetting Mr O Neil and his staff also at Euston House, who did so much to make this day such a great success.